What is “gender equality” in a workplace? Is it equality in terms of gender proportionality? Or perhaps a simple refusal to make decisions when hiring or promoting based on pre-formed expectations about gender? If gender equality is assumed to be a desirable goal, is it best achieved through affirmative action or through non-preferential treatment? The dialogue on gender roles is a heated one. With thousands of studies – often contradictory – conducted on the subject, opinions often fly ahead of the facts. Does gender equality exist, or can it – or should it? Are societies moving towards it in productive and observable ways? How often does a call for increased gender equality in the work place reflect an actual commitment to the goal of increasing opportunities for an under-represented group, rather than an insincere assertion of views thought to be politically correct? Regardless, the facts are key. With this issue CEE Legal Matters introduces a two-part report on gender equality at law firms in and across Central and Eastern Europe. This month’s focus will be on the numbers. In the next issue, mid-June, the focus will turn to the explanations, justifications, reasons, and underlying causes. The debate will presumably never end – nor, perhaps, should it – but a greater understanding of the facts and insightful analysis should at the very least provide the basis for a more enlightened and informed conversation. The data in this report was gathered from the websites of 488 law firms ranked by Chambers & Partners – in any practice area – across 20 CEE jurisdictions: Albania, Austria, Belarus, Bulgaria, Croatia, Czech Republic, Estonia, Greece, Hungary, Latvia, Lithuania, Macedonia, Poland, Romania, Russia, Serbia, Slovakia, Slovenia, Turkey, and Ukraine. The remaining countries in CEE had fewer than 5 ranked firms with useful websites, and were thus excluded as providing insufficient data. In addition, law firms ranked by Chambers but with websites that do not distinguish between Partners and Associates – a total of 60 in all – were excluded from consideration. 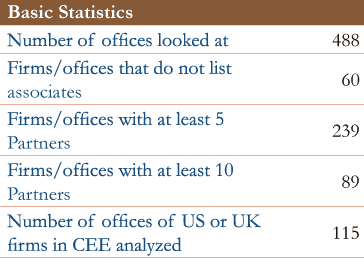 The various offices of law firms with bases elsewhere were included for each country (i.e. DLA Piper Romania, Allen & Overy Moscow, etc.). “Associates” for the purpose of the survey includes any lawyer not identified as Partner (i.e., Junior Associate, Associate, Senior Associate, (of) Counsel, etc.). Data was collected from law firm websites between April 1, 2014 and April 7, 2014, and the accuracy of the final figures thus depends on the accuracy of those sites at those times. Discriminatory hiring practices against female associates appear not to be present in Belarus, at least, as women in that country account for 77% of all associates. Macedonia is another outlier, with women taking 70% of all associate positions in law firms in the country. Women in Hungary, by contrast, make up the lowest percentage of associates in law firms in the region, accounting for only 44% of the roles. Austria and the Czech Republic (both 45% women), and Poland (46%) show very similar results to Hungary’s, while female associates in other CEE markets make up between 48% and 66% of the total in those countries. The numbers for partners are very different. Austria has the lowest percentage of female partners, with just 15%, Romania has the most, with 45%. And Belarus, which had far and away the highest percentage of female associates in CEE, seems to lose them before partnership; only 31% of the partners in that country are women. Of course, while the ratio of men to women partners in a given law firm may be similar or even identical to the ratio in the country as a whole, in many law firms the proportions are very different. The top five firms in terms of the percentage of women in partnership are: Red Attorneys at Law (Latvia) – 100% (5 of 5), Vlasova, Mikhel & Partners (Belarus) – 86% (out of 7), NNDKP (Romania) – 84% (out of 19), Akol Avukatlik Burosu (Turkey) – 80% (out of 5), and Vernon David (Romania) – 80% (out of 5). Of the 89 offices with at least 10 partners in CEE, only three have more female partners than male – and all are in Romania: NNDKP (84%), the Bucharest office of Schoenherr (64%), and Musat & Asociatti (56%). The fourth position is shared by four firms, all with 50% female partners: Herguner Bilgen Ozek and Mehmet Gun & Partners in Turkey, Cerha Hempel Spiegelfeld Hlawati in Hungary, and Tark Grunte Sutkiene in Ukraine. In the other 82 of the 89 offices, men make up a majority of the partnership. In contrast to the 1 firm/office with at least 5 partners, none of whom are male (Red Attorneys at Law, in Latvia), 142 firms/offices have a minimum of 5 male and no female partners – and 5 offices in CEE have partnerships of 10 or more, none of whom are women. The Austrian offices of Binder Grosswang and Freshfields, the Czech offices of PRK Partners and BBH, and the Polish office of Greenberg Traurig, each fits this description. We recognize that the subject is controversial – and it has already inspired more than one heated conversation around our editorial table. We look forward to hearing comments from our readers on the subject. We will include as many of those comments in the next issue as possible, along with the second part of the report.